SmileyWorld has launched a new AW14 childrenswear collection, marking the brand’s first major release into the Chinese children’s apparel market. 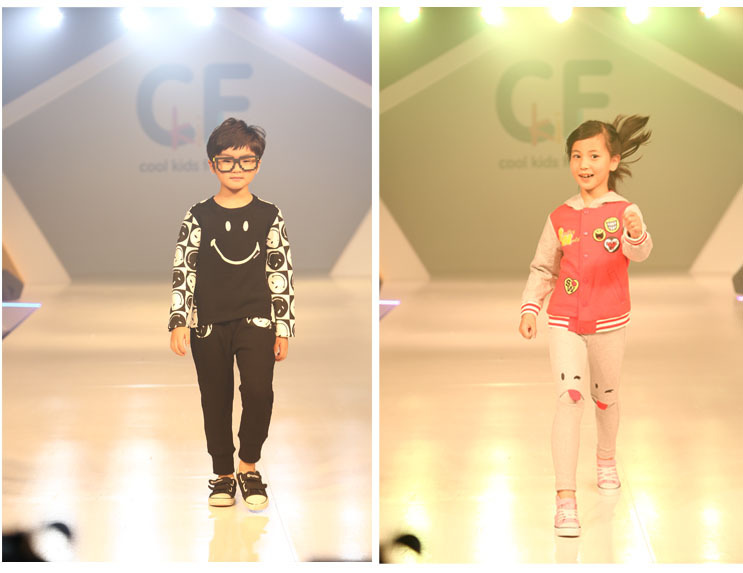 The designs were showcased on July 23rd during a fashion show at Cool Kids Fashion Shanghai, one of the biggest kidswear trade shows in Asia, and were also presented on a specially designed SmileyWorld booth. Following on from the SmileyWorld adult’s collection, which was previewed at Chic Beijing earlier this year, this new kids range will be aimed at boys and girls who want cool, comfortable clothing. Retail prices range from 199 RMB – 999 RMB, and will launch in 50 department stores around China this summer as shop-in-shops. Smiley also plan to open 150 freestanding Smiley World stores within 5 years. For girls, colour pops of pink, yellow and purple feature on cute coats, fun dresses, jumpers, leggings and long sleeve tops. For boys, blue, mustard and red are the main colours on puffa jackets, warm hoodies, jeans and sweat pants. The smiley face has been altered and reworked in a range of different emoticons across the entire collection, each design representing one of the many expressive icons that make up the ‘Express Yourself’ Smiley World collection. Nu Icons embraces Smiley’s past and mashes it up with our digital future. This new and innovative apparel concept is ergonomic, bold and to the point, designed for the digital native where NuSmileys can be scaled across a multitude of media. It is expressive in its messaging and striking in its appearance. Utilising graphics across primary and bright colour palettes, often with fluorescent highlights, with a lean towards Smiley’s electronic music past and the nu rave movement. Whilst also creating a new digital music legacy for the present and future. For girls, cute captions including ‘love’, ‘be mine’ and ‘lucky’ feature alongside smileys transformed with heart and four-leaf clover digi-prints, while for boys there are more boisterous words such as ‘rebel’, ‘strong’ and ‘awesome’. The Smiley Nu Icons illustrations are thick, regular and angled to compliment digital media’s natural design simplicity and immediacy. Smiley are delighted to return to this year’s Bread & Butter trade show in Berlin after a 2 year hiatus, to showcase the latest collections to the most influential buyers, designers, press and fashion insiders in the industry. For SS15, Smiley will be launching its latest offering from premium streetwear collection Smiley London and debuting Smiley World ‘new icons’, an apparel collection inspired by digital emoticons. 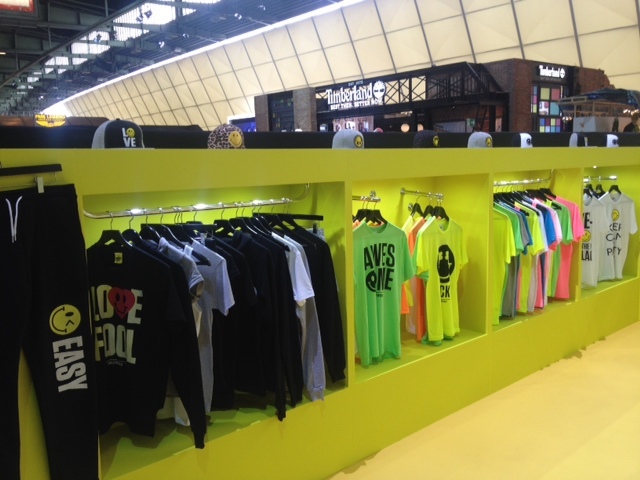 Smiley will also be exhibiting its latest technical accessories including sunglasses, headphones and skateboards. 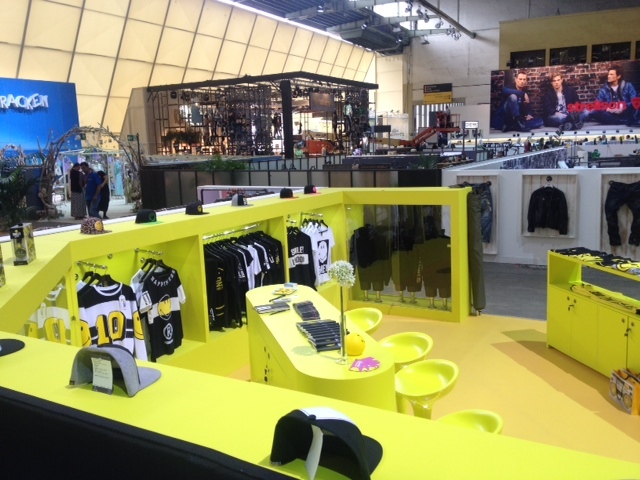 These Smiley collections all take inspiration from the brand key influences; music, urban street culture, and colour, each of which is reflected throughout the brands stand design, which incorporates bright yellow colours, metallic mannequins and metal fixtures, the stand also has a futuristic feel. Bread & Butter is one of the biggest trade shows in Europe, with 600 brands exhibiting over 3 days from the 8th-10th July at Berlin Tempelhof, and a public viewing in the evenings. This internationally prevailing trade show provides a creative marketing and communication platform for selected brands, labels and designers from the progressive segment that is unrivalled throughout the world. As the happiness movement continues to gather pace as the latest global phenomenon, Smiley remains at the forefront of this. Smileys unique brand mission to ‘Spread Happiness’ and serve its customers with some of the finest products in the world continues to cement the brand as a best seller with many of its major retail partners. 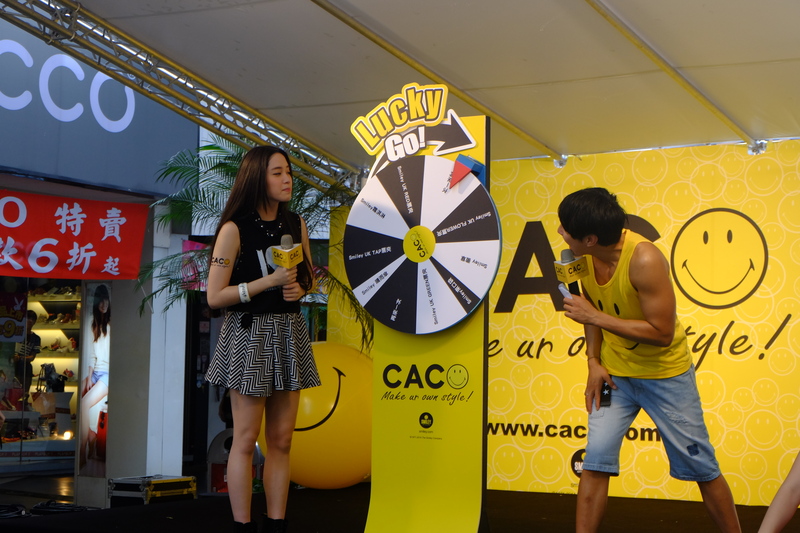 On Friday 5th July, Smiley launched a new partnership in Taiwan with fashion retailer CACO under a backdrop of brand activations. 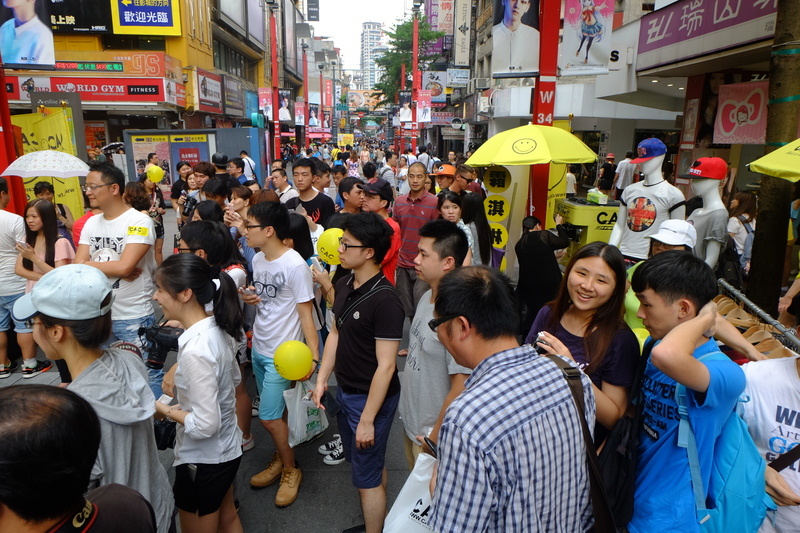 This launch event took place at the Ximending Mall in Taipei, and featured games, ice creams, DJ sets, live band, dancers, a fashion show and the chance to win Smiley goodies. The new SS14 collection is available in all CACO stores across Taiwan and targets men and women. Customers can choose from Smiley World designs, which use different emoticons, or the Smiley Original design. The women’s collection features intimates, including pants and vests, in pastel colours, while the daywear range uses monochrome prints with highlights of yellow on cropped t-shirts, vests, leggings and shorts. For men, bold designs on vests and t-shirts stand out, and colourful Bermuda shorts complete the casual daytime look. Accessories also feature throughout this range, including hats, tote bags, purses and rucksacks. As part of Anya’s Hindmarch’s SS14 collection, a cheeky and Smiley inspired collaborative piece was launched at the end of her galactic catwalk show. Presented from hanging wires, several of the must-have fashion accessories for 2013/14 were displayed between flying models and giant Smiley zorbals in the ceiling at the glamorous Central Hall in Westminster. Named the ‘Happy Shopper’, it’s typical Anya’s British twist of humour to translate such a easily available plastic product into a desirable and limited edition piece which had heads turning on the final day of London Fashion Week. Space Ibiza, the world famous clubbing temple of old skool, electro and house music, Space Ibiza opens its door to a world recognized clubbing ambassador: Smiley! Finally a collaboration between two clubbing icons Smiley and Space Ibiza. 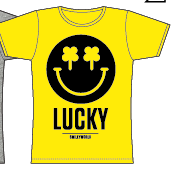 Yes, we are talking about the super cool t-shirt collection SMILEY & Space Ibiza that unites the iconic yellow Smiley face and the most famous of Ibiza clubbing souvenirs the Space Ibiza T-shirt. 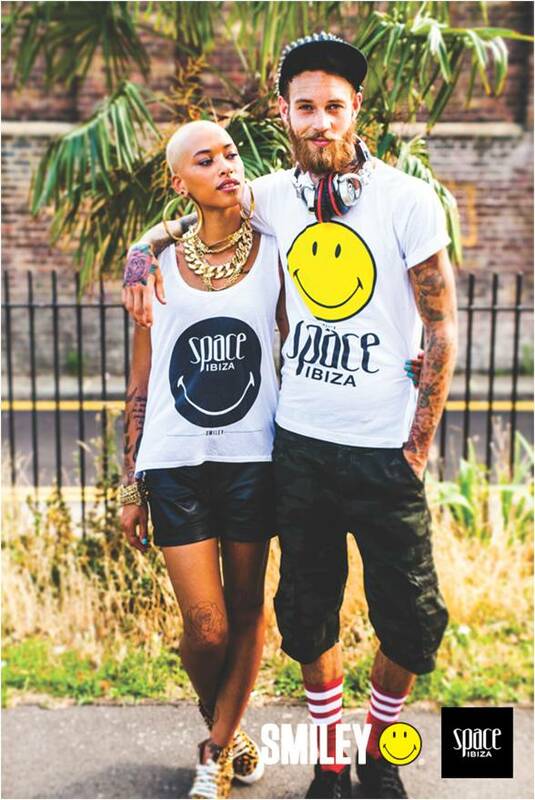 The effortlessly chic vibe of the Smiley Space Ibiza tee collection for men and women is bang on trend inspired by the 90’s clubbing trend as we go back to our roots to our 90’s club land heritage reviving the spirit of our original SMILEY. For all those craving the hedonistic feel good vibes of most famous party island in the world visit the Space Ibiza website: hard party fashion guaranteed!